They start arriving in your mailbox or on the radio in a trickle, with mostly positive vibes. This candidate will help the children, that candidate will get tough on crime. But then the political messages seem to fill your mailboxes and the airwaves. And they seem to be taking a decidedly nasty turn. That’s the pattern New Mexico In Depth found in reviewing mailers and other messages contributed by our readers, friends, sources, campaigns and the University of New Mexico library patrons as part of our Follow the Message site. Since mid-August, we’ve examined 134 messages delivered by 48 different messengers concerning 46 candidates in 32 contests around the state. But the messages we have provide an insight into what both candidates and outside groups are doing as they try to sway voters. And they offer some surprises. For instance, House District 30 tops our list with 19 different messages. Two years ago, Republican House Majority Leader Nate Gentry won reelection in this Albuquerque district with 54 percent of the vote. He’s clearly determined to win again in a district where voter registration is 42 percent Democratic, 34 percent Republican and 19 percent unaffiliated. Gentry’s sent at least 11 mail pieces to the district. Four of them were attacks on his Democratic opponent Natalie Figueroa. And he began airing TV ads last week. Figueroa has sent at least five mailers, four positive and one contrasting herself with Gentry on public safety. 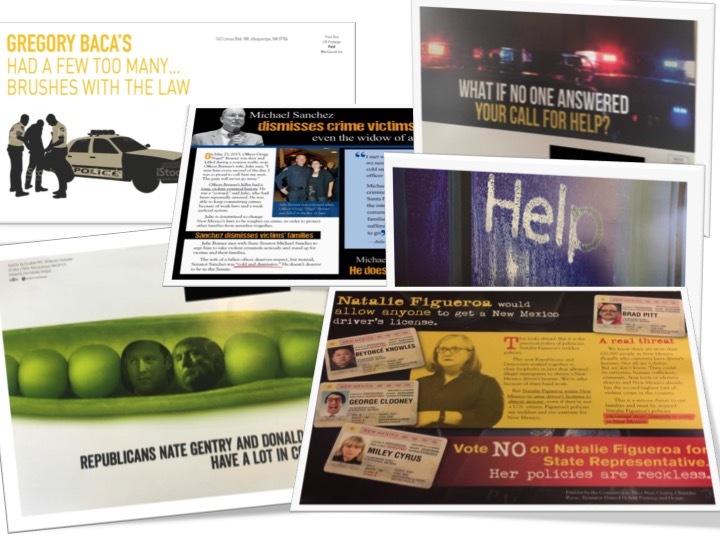 Two political action committees sent mailers attacking Gentry in recent weeks, including one that attempts to link the majority leader to GOP presidential candidate Donald Trump by portraying them as two peas in a pod. The state Republican Party filed a complaint about the group that sent that flier, but it was after the deadline for such filings. What isn’t surprising is the increase in attack ads as the election gets closer, said Lonna Atkeson, a political scientist at the University of New Mexico. Half of the messages gathered thus far by NMID are negative, while 44 percent are positive. And of those negative messages, 75 percent are from outside groups, primarily super PACs, while 25 percent are from candidates. Those super political action committees may take unlimited campaign contributions to spend money independently of political parties or candidates. New Mexico campaign finance laws don’t require PACs to report that independent spending in specific contests, although some do. That means it’s tough to tell exactly how much money is being spent on a race by outside groups. Topping that list of negative spenders is super PAC Advance New Mexico Now, which is operated by political consultants affiliated with Republican Gov. Susana Martinez. That group has delivered at least 15 negative messages targeting four Democratic candidates. But at least one-third – and the most costly – of Advance messages are targeting Democratic Senate Majority Leader Michael Sanchez of Belen. Advance is spending more than $300,000 on TV ads attacking Sanchez. The group also is airing radio ads against him. Sanchez is being challenged by Republican Greg Baca in a Senate district that’s 48 percent Democratic, 29 percent Republican and 19 percent unaffiliated. Calls to the Advance phone number listed on campaign finance reports, which is the same number listed for the group’s primary consultant, McCleskey Media Strategies, weren’t returned. That firm is operated by Jay McCleskey, Martinez’s top political adviser. NMID also called Advance’s treasurer, Jessica Perez. “I’m not interested in commenting. Sorry,” Perez said. Heather Brewer, who is directing the super PAC New Mexico Together to support Democratic senators including Sanchez, was more than willing to talk about Advance. “This is a race of Susana Martinez-slash-Jay McCleskey trying to take out their personal vendetta against Sen. Sanchez,” she said. With Republicans trying to hold their 37-to-33-seat majority in the House, won for the first time in 60 years, there are questions whether Advance should be focusing on Sanchez at the potential expense of competitive House races. UNM political scientist Atkeson said the spending against Sanchez makes sense from a standpoint of demonstrating control in terms of taking out a legislative leader. “It shows really a lot of power,” Atkeson said. “It has a lot of emotional clout, psychological clout. Obviously, they think it’s a possibility” to defeat Sanchez. Meanwhile, New Mexico Together is targeting six Senate races, including the Senate District 29 race between Sanchez and Baca. The group is airing radio ads, sending mailers, running digital ads and has created digital ads about Republicans in the districts. The group is addressing issues such as environment, education, abortion, past arrest records and financial mismanagement. Brewer said the messages were selected based on research and polling, but were difficult to select. Republican candidates and outside groups, however, are primarily addressing the crime theme. Conservation Voters New Mexico’s Verde Voters Fund is targeting Republicans in several races. “We also do coordinate with other environmental and progressive groups … to be as efficient with our resources as possible,” he said. Verde Voters is airing TV and digital ads, as well as sending mailers. But Shelton said the group finds mail to be the least preferable of options. Shelton said while a handful of PACs are working to support Democrats, Advance and GOAL WestPAC, a federal super PAC affiliated with GOP U.S. Rep. Steve Pearce, are the two big names in supporting Republicans. NMID has received three mailers from GOAL West, but there are likely plenty more out there. Today is a filing day for New Mexico candidates, the third for the general election. It’s another important day as Republicans fight to hold their two-year majority in the House and take over the Senate, while Democrats hope to take back the House and hold the Senate.